The BBC has announced that classic excerpts from Tomorrow's World have appeared online legitimately for the first time. 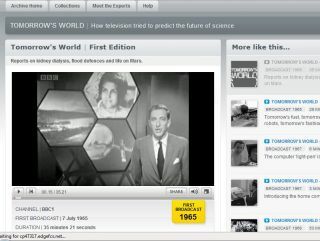 The show, which ran from 1965 to 2003, was one of the Beeb's flagship programmes, and focused on future trends in technology. While the predictions on the show weren't always right, a number of gadgets and gizmos which have shaped are lives today were first introduced on Tomorrow's World. These include: CD players, camcorders and Teletext. Clips from the show can now be found online at www.bbc.co.uk/archive/collection, a website run by the BBC which shows off some of the broadcaster's 70 years of content. Maggie Philbin, a former host of Tomorrow's World, has written a piece for the BBC about the addition of the show to the BBC archives, in which she notes: "The home computer, the mobile telephone and the compact disc all made their debut on the show. "I would love to say I recognised their significance immediately but often the technology was fragile or incomplete - a mixture of space age and Stone Age - and the real potential was hidden." Currently there are 23 clips in the archive, ranging from an hour long to five minutes. The BBC says about the clip bundle: "In this collection, we witness a change in how people thought of the future and chart the rise and rise of the computer." See for your self here.